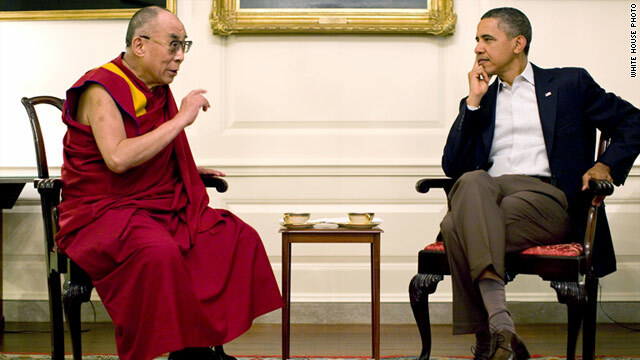 President Barack Obama meets with the Dalai Lama at the White House on Saturday. (CNN) -- China spoke out strongly Sunday against a meeting between U.S. President Barack Obama and the Dalai Lama, saying it "hurt the feelings of the Chinese people and harmed Sino-U.S. relations." "This action seriously interfered with China's internal affairs," said Ma Zhaoxu, a spokesman for the Chinese Foreign Ministry, in a statement, adding that officials have lodged formal complaints with their U.S. counterparts in Beijing and Washington. Obama met with the Dalai Lama on Saturday in Washington, commending the Tibetan spiritual leader on his commitment to nonviolence and pursuit of the "Middle Way" approach with China, the White House said in a statement. During the closed-door visit at the White House, Obama stressed the U.S. policy that "Tibet is a part of the People's Republic of China and the United States does not support independence for Tibet," the White House said. In the nearly 45-minute meeting, the president voiced support for "direct dialogue" between China and Tibet as a way to peace, the statement said. "The Dalai Lama stated that he is not seeking independence for Tibet and hopes that dialogue between his representatives and the Chinese government can soon resume," the White House said. American support of the Dalai Lama has long been a subject of contention in U.S.-China relations. Chinese officials view the religious leader as a separatist. The issue of Tibet is one that "involves China's sovereignty and territorial integrity," Foreign Ministry spokesman Hong Lei said in a statement released before the meeting. "We oppose foreign leaders meeting with the Dalai Lama in any format." The strong objection to the meeting continued after it was over. "By allowing the Dalai Lama to visit the U.S. and arranging the top leader to meet him, the United States has seriously violated basic principles of international relations and its own repeated solemn pledges, and harmed Sino-U.S. relations," Ma's statement said. "China therefore expresses its strong indignation and firm opposition." The statement concluded by calling on the U.S. "to take China's solemn and just stance seriously, and adopt immediate measures to eliminate adverse consequences." The president last met with his fellow Nobel Peace laureate in February 2010. The Dalai Lama expressed hopes that his relationship with China can improve, with U.S. help. The current Dalai Lama is also known by the name Tenzin Gyatso. He was born in 1935 in modern-day Qinghai, China. The term "Dalai Lama" is a Buddhist religious title. In traditional Tibetan belief, the title is given to those who are the reincarnations of a line of revered religious teachers. The current Dalai Lama is considered the 14th in this line. The Dalai Lama has been in Washington on an 11-day visit. He has conducted a mass ritual for Buddhists and met with several lawmakers on Capitol Hill. CNN's Steven Jiang contributed to this report.